We believe in more than magic- we believe that all families can enjoy traditions and festivities together every day of the year! Even if it does take a little sorcery at times. If all the fun- without all the candy- is the spell you’re looking for, then we can help! What exactly is the Legend of the Swith Witch? Every year, in the beginning of October, many many young Switch Witches say goodbye to their parents, hop in their flying cauldrons, and go visit kids (like yours!) for a long sleepover play date! During the weeks leading up to Halloween, kids should be a kind host to their own Switch Witch. In exchange for a nice visit, your child's Switch Witch (wink! wink!) will turn some of the collected Halloween candy in to a gift! Maybe your child's gift will be a new book, a toy, sporting gear, a new backpack, or even a gift certificate for a special outing with a grownup they love. 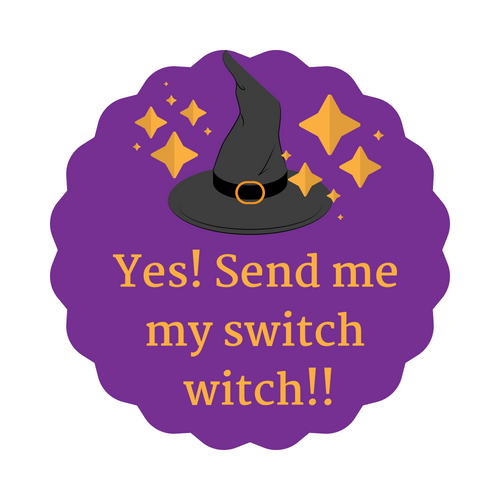 Switch Witches are very clever and imaginative – yours will know just what your child would love for a gift! Then off they all fly – back home to their own families – until next Halloween when they will return to visit again! Is this just a gimmick instead of simply telling my kiddo "no" to all that candy? The Switch Witch is about making the holiday enjoyable for your family- in whatever way you need it to! If inevitable grumpiness over candy limitations will wreck the enjoyment in your family- then you can certainly use this as a resource to ease into boundaries. Other children who have to limit candy for reasons like diabetes, or who have to skip Trick-or-Treating because they are immunocompromised or hospitalized, or who are part of a growing number of kids managing food allergies and can't risk most of the passed candy - are all groups of families who have adopted this tradition in their homes. We believe there are many ways to make it work for many families! Can I touch my Switch Witch? Well, just like every person is different, every Switch Witch is different too! Some Switch Witches don’t mind if you touch them and play with them, but others would prefer to be left alone – just like some kids like hugging or wrestling, and other kids don’t! A grown-up in your home can help you know what is okay with your Switch Witch. Is my Switch Witch watching my behavior?